Perogies & Gyoza: Soccer Week: Goal! 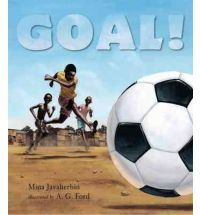 In a shantytown of South Africa, Ajani receives a real regulation-size soccer ball for his reading skills, and shares it with his friends. Their fast-paced and jocular game is interrupted by some bullies - but the friends manage to deal with them and keep their ball for future games. The verse is rhythmic and captures the action and movement of the boys and the ball. As decriptive as it is, its real value is in the message of hope. Ajani says "I follow the ball to end of the alley/I follow the ball to the end of the world." The reader truly gets the sense that these boys can do anything. The vivid illustrations capture the poverty and lack of safety that permeates the world of these soccer players, and somehow make the various shades of brown of a dry slum look not like something to be pitied, but a place that is real. Ford captures both the expressions of the determined youngsters and the movements of their bodies with incredible clarity. As different as this world is, with water brought from wells and the necessity of lookouts while these boys play, and event the fact that they call this game football, it was the similarities to our lives that drew in my son and I. The big blue sky that goes on forever reminded me of Big Sky Alberta. The dry sand and dirt on which the boys play resembles my son's soccer field so much more than the generous grass in the other soccer stories we're reading this week. But it is the determination of these boys to give themselves an outlet for their passion, no matter the obstacle, that reminded me most of my son. This exquisite book has so much that it will interest for many years to come; geography, economics, sports, friendship, self-confidence, ingenuity, and even how to deal with danger without locking oneself inside away from it. This is probably the best sports-related book we've ever read. This book is the third I have read for the Read the World Challenge. How are you keeping up with all of this reading and reviewing and posting?!! Very impressive! Now, I need to go out and buy a soccer ball. My daughter will love it. That book looks awesome! I just pinned it so I can remember.